There are lots of reasons why startups rely on sweat equity to get things off the ground but is sweat equity really worth it? The media is littered with stories of co-founders who have split, or business that have run into difficulties, many of which can be traced back to the underlying challenges of sweat equity. However, in those early days when cash is tight, the appeal of sweat equity is undeniable. This blog will open your eyes to the benefits of sweat equity – but also alert you to the most common pitfalls to avoid – so you can decide for yourself whether sweat equity is worth the perspiration! Sweat equity is a non-financial investment that individuals (usually founders, co-founders and directors) receive in recompense for their contribution to a business. Sweat equity is often offered in exchange for work done for free – or at a reduced market-rate – hence the term “sweat”. However, sweat equity can also be offered in exchange for intellectual property rights, “know-how”, reputational association, introductions to key contacts or provision of materials, tools and space. So what’s the appeal of sweat equity? Let’s face it, no startup is ever awash with cash so anything that avoids cash burn but still gets things done is bound to have appeal. If salaries can be off-set or reduced by offering shares in the business, or if software can be built for shares instead of cash, who wouldn’t consider these options? In the early days, most startups will consider anything to get their business off the ground. Offering sweat equity can also offer startups the opportunity to attract a co-founder or key employee of a calibre they wouldn’t otherwise be able to afford. Gaining shares in a business that is full of promise has value, particularly to someone who sees their own ability to increase that value. A win-win situation is created as employees with sweat equity work to grow the business, thus increasing the value of their shares as the business grows in scale and success. Return from equity comes over the long term so, as with any long-term relationship, you need to be sure you and the person getting sweat equity are compatible. Are you sure the person to whom you are offering sweat equity is as committed as you to the project? Will they stick with it through thick and thin? Do they share your vision and passion for the business? Done well, sweat equity aligns motivations and deliverables but it can have unintended side effects. If, for example, you are offering shares instead of payment for work undertaken be aware that no one can survive without any income. If you only offer shares in exchange for work done how do you expect that person to live and pay their bills? If an individual doesn’t have sufficient money in the bank for basics, they will be forced to work on top of what they are doing for you – reducing the time they can spend on your project. The same applies if you offer sweat equity to a business. If the business doesn’t have revenue to pay salaries they will be forced to take on other contracts which may impact on the time within which your project can be delivered. Are you willing to live with that compromise? Don’t hand out the promise of equity willy-nilly. Be clear about what you are offering and what you expect in exchange. Clearly, for both parties to feel happy there needs to be equitable value. That will require definition – and specifics. Don’t rely on implication “you have good communication skills and a strong network so I thought you’d make introductions”. Be very clear about what you want “I am offering X% of shares in this business in exchange for introductions and support in closing an investment deal with Y and Z investors”. You might break the vesting of equity into stages based on delivery triggers. The biggest challenge with sweat equity is reaching agreement about fair value. It can be very difficult to value start-ups and early-stage businesses. Traditional models used for valuing businesses don’t work because they rely on stable and predictable revenues which very few early-stage business have! Instead you are left valuing the business based on its market potential or the assets already created by the business. On the other side of the coin, how do you value the time provide by the person being offered sweat equity? Do you value their time – as if paying a salary? Or should you value what that time creates – a working platform, creation of key partnerships, delivery of first customers and revenue? There is no denying it – valuation is tricky. This can cause the allocation of sweat equity to be postponed – or it’s handled in a conversation and never formally written down. That is when misunderstanding and discontent occurs. Hard as it is, if you want to avoid a cold shower down the line, formalise what is being offered in terms of sweat equity – and get it written down early on. Anyone can come up with a “brilliant business idea” but it is quite another thing to put your money where your mouth is, take the plunge, give up your job and commit to making your idea a reality. For many founders of startups, taking the decision to leave your job – and a predictable salary – to commit to building your startup full-time can be terrifying. But it doesn’t have to be. There are steps you can take to prove you have a viable startup which reduces the risk, builds your confidence and makes it easier to attract funding. 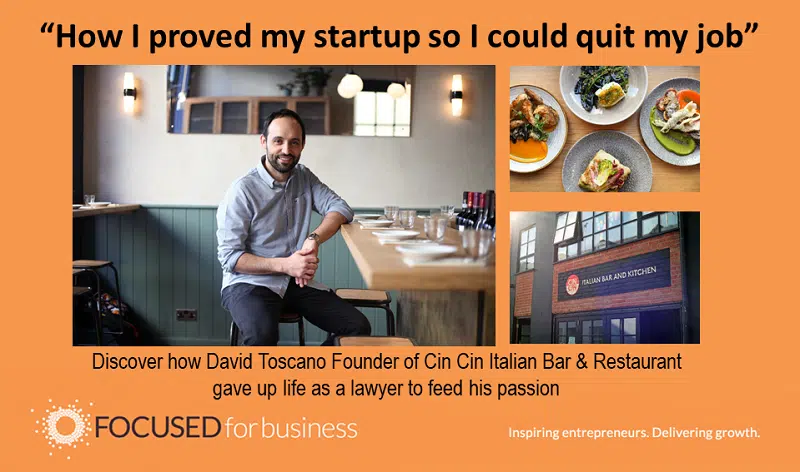 David Toscano of Cin Cin Italian Bar & Kitchen did just that and Hatty Fawcett of Focused For Business asked him to share the steps he took to build his successful restaurant business – and what gave him the confidence to give up his profession as a lawyer to follow his passion for Italian food. Hatty: How long had you been thinking about your business idea before you decided to take the first steps in getting your business off the ground? David: About 10 years. I qualified as a lawyer back in 2001 but was bored of that career about two years in so I started to look for a way out. I spent a lot of time thinking I was not capable of doing anything else. Hatty: Who or what pushed you to take action in creating your business? Having grown up in an Italian family, food was always central to my childhood and something I had always felt comfortable with. Hatty: What initial steps did you take and why did you choose these steps? David: The very initial steps were saying yes to catering parties and dinners for family and friends in 2010, even though I had no chef training or experience. So in 2012, I bought a vintage Fiat van and converted it into a street food van which in 2013 I launched as Cin Cin, an Italian street food and event catering business. I started trading at festivals and fairs, as well as taking private bookings to cater weddings, parties, celebrations; all while still working as a lawyer in London. I was also aware that I was moving into a completely new sector that I had no experience in so I had no idea whether I would even enjoy working in food & drink. Thankfully, I immediately loved it! I was enjoying event catering and starting to pick up bigger events which meant I was turning some good profit but by 2014, I was sure that I wanted to open a restaurant so started to look for a chef to work with to put on supper club/pop up restaurant events. This was because I wanted to take the food beyond the limitations of the van and make the Cin Cin offering more refined. That summer I met Jamie Halsall, who is now my head chef in the business, and we started putting on supper clubs in Brighton, London and Kent. This step helped bridge the gap between the van business I had started and the restaurant business I wanted it to become. Hatty: What did you learn by taking these initial steps? David: These initial steps allowed me to test the development of the offering in low risk scenarios – I was still working as a lawyer so was not reliant on the income from the fledgling business to fund my lifestyle. Hatty: Was there a specific event or turning point that gave you the confidence to commit working full-time in your business? David: In Spring 2015, the business had grown to the point where I no longer had enough leave days from my job as a lawyer to cater all of the events I was being offered. Hatty: What influenced your decision to raise investment? David: I opened my first restaurant in November 2016 with my own funds. It was a small 20 seat restaurant, all housed in one room which meant the set up costs were relatively low. By Spring 2017, we were constantly full so I began looking for a second larger restaurant site. 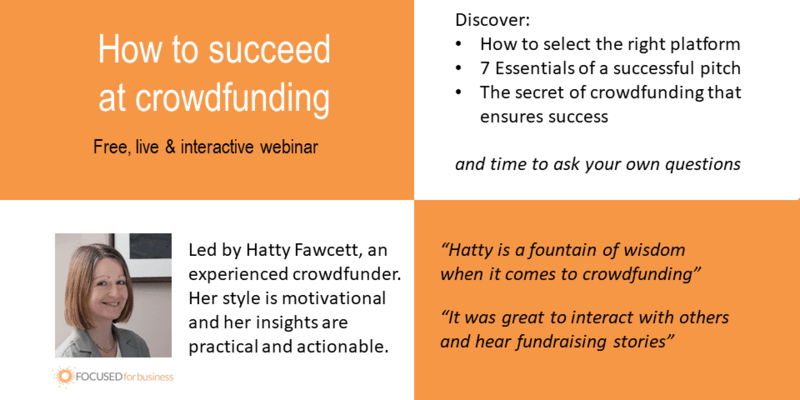 Hatty: Did the steps you had taken to prove your business model make it easier to raise funding for your business? David: Absolutely. As above, I used the Enterprise Finance Guarantee [EFG] scheme to access bank finance because the business did not have fixed assets to borrow against. In order to access that finance, I had to submit a business plan with costed financials to show that this step to growth was sustainable. Hatty: Do you have any advice or tips for entrepreneurs thinking about starting their own business? David: Lean testing – there are a lot of ways to try out what you think you’d like your business to be without risking your personal finances with a loan or spending a lot of your savings. But just as important is that it’s also the best and least risky way to get feedback from potential customers about whether your business model and offering is actually what people want. Be prepared to listen and adjust your offering to suit the market. Passion – I worked hard to become a lawyer but never had a passion for it. Working on something you do not care about is a recipe for mediocrity or even worse, failure. Do it now – you can come up with a million reasons why you should not to take a chance on starting your own business or pushing it forward. I spent the best part of 10 years telling myself I could not do it. But rather than saying ‘I wish I’d done it earlier’, I have always just tried to grow the business day by day and make decisions for growth as promptly as I can. Does your Startup or Small Business need a Non-Exec Board? When you first start a business there can be little need for a formal Board. Small teams – indeed the team may just be the Founder – usually develop their own informal ways of reviewing options, discussing issues, making decisions and reporting progress. However, as the business grows, and particularly if you take external investment, formalising these processes and introducing impartial, independent advisers into the business in the form of non-executive directors can be very helpful. Why would you want a Non-exec Board? Introducing external directors to a startup or small business brings outside experience and fresh perspectives into the business. External directors – often call Non-executive Directors, Non-execs or just NEDs – are usually experienced, senior business people who have worked in a range of businesses or who may have run and successfully sold their own business. They help founders and business owners by sharing their knowledge, skills and experience of a specific sector or discipline, all to the benefit of the startup or small business. For founders and business owners – who often work on their own and can feel lonely – such benefits are a god-send. Is a Non-exec Board always the best option? Bringing together a Non-exec Board isn’t, however, without cost. It can take time to find the right person with the appropriate mix of skills and experience – and may involve search and recruitment fees if you seek external help with this. Once you have found your ideal candidate they may require a retainer fee for their services. Having a board also has hidden costs in terms of the time required each month to prepare reports, arrange meetings and keep Board members informed of developments. If your startup or small business is not yet ready to incur these costs then there are alternatives. Peer Boards which bring together business owners (usually on a monthly basis) to support each other with impartial business advice offer many of the benefits of a Non-exec Board but without the costs and hassle. Accessing or working with external funding and investor interests. Importantly, the Entrepreneur Boards hold you to account in setting and reporting on actions and deliverables. Joining an Entrepreneur Board keeps you on track and gives you an access to a wealth of experience – just like having a Non-exec Board. You’ve got a great start-up, the businesses is getting traction or – better still – its showing strong growth but you need to find investors to make the most of the opportunity. You’ve written the business plan, you’ve perfected the financial forecast and you are ready to pitch but who are you going to pitch too? Where are you going to find investors and “business angels” to back your investment opportunity? It’s a question almost every founder and entrepreneur will have asked themselves at some stage. I interviewed three founders who have either recently raised investment or who are currently raising investment for their advice and tips. Jason Kirk of Kirk and Kirk, Dominic Wong of BoRo Experiences and Shon Alam of Bidweg were generous in sharing their thoughts. When I was raising investment for my own start-up (Seek & Adore), I remember the best piece of advice I was given was “you have to kiss a lot of frogs before you find your prince (or princess)”. This phrase stuck in my mind as I fixed meetings, grabbed a quick cup of coffee or attended pitch meetings with investors. It certainly helps if you enjoy meeting people and it can sometimes help to think of it as a game – “how many new potential investors did I meet this week?”. All three founders agree that the best place to find investors is to start with people you know. Whilst you will talk to many people whilst raising investment, for those conversations to result in investment they need to be anything but superficial. You wouldn’t ask someone to marry you on the first date. Generally, you want to get to know someone, find out what you have in common – and what you don’t – and reach a point where you trust and respect each other before making any lasting commitment. So it is with investors. True relationships are two-sided. You have to give and receive – another useful premise to have in mind as you start finding investors. We’ve all been on the receiving end of “spam” – communications from people who know nothing about us, offering something that we’re not even sure we want to know about. How well do you react to such approaches? Investors feel the same. The aim of all your conversations with investors is to create a shared strategic vision, trust and mutual respect. Ideally this should be founded on a sense of equal worth, reciprocal value being offered by the founder and the investor – and yet so often people talk about an imbalance of power between investors and founders. The founders I interviewed certainly felt this. Raising investment is time-consuming and it can – at times – be soul-destroying. All three founders recognised the need to manage your motivation and energy levels so that you stay positive throughout the process. A focused, methodical approach to finding, warming up and closing deals with business angels and crowdfunding investors. When is the right time to raise investment for your startup? This might seem an odd question. You go for investment when you need money, right? Wrong! Not only does it take time to raise investment – so you want to start raising investment at least 6 months before you need the money – but there are stages in every business’ life-cycle when it will be easier to raise external investment. Going for investment just because you need the money could mean you’ll waste time and energy. Worse still, the distraction of raising investment may mean your business suffers – making it harder still to raise investment. So, when is the right time to raise investment for your startup? 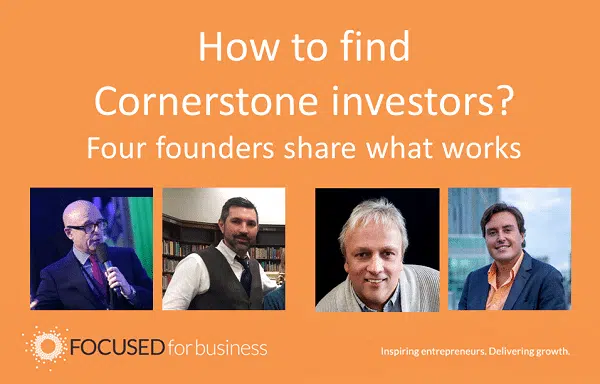 Hatty Fawcett, Founder of Focused For Business, interviewed two founders who have successfully raised investment in the last year and asked them whether there is a “right” time to raise investment. Adam Beveridge, Co-founder of Hollabox, started his startup in 2016 and raised investment the same year and went on to raise a second seed round a year later. Hollabox is a social media that makes it easy to see inside the best venues, restaurants and places in real time so you can decide where to go for a great night out. Sue Frost, Founder and CEO of Curamicus started her startup in 2015 with founder investment and a startup loan. She went on to raise seed investment in 2017. Curamicus provides wearable assistive technology for elders and vulnerable people that detects and reduces the risks of falls. Hatty: Let’s start with the big question, is there a “right time” for a startup to raise investment? Adam: This is a tough question to answer, as each business case is subjective and each investor has their own investment criteria. From my experience, I would say the most sought after criteria investors want is revenue from a proven business model. The next “expected” criteria, would be a dedicated, full time founding team and a strong vision. A team breaths confidence, a strong vision helps form a path that people want to join you on. It’s a minimum starting point for any venture, I would say. Sue: I think from a startup point of view it’s best to raise investment when you have a developed true business concept to the point that you’re able to prepare a detailed business plan. Preparing a business plan takes you through the process of self-examination as to the viability of the business for yourself and also clarifies what you’re offering in return for investment. Hatty: Do you think a startup can go for investment too soon – or leave it too late? Adam: A start-up can certainly try and raise too early. Because of this, you want to make sure when you’ve finally got in front of the right people, and it will take a lot of intros and knocking on doors to get there, you have the right things to say. Otherwise you’ll get a “no” and realise you’ve wasted months of your precious runway. To avoid wasting time, build credibility with an industry relevant advisory board, make powerful connections and partnerships, (with brands, accelerators and entrepreneurs) and focus on proving your market and concept as cheaply and efficiently as possible before you go for investment. But be wary of leaving it too late or investors may question your startup’s speed to market and scalability. Sue: There are different stages to business investment applicable as a business grows. Hatty: Thinking about all the times you have raised investment, have you ever found it easier or more difficult to raise investment and what do you attribute that to? From the subsequent investors viewpoint, we had already been through the due diligence process with the first investor and this provided some level of confidence to subsequent investors. Adam: It’s a lot easier when you already have capital committed, and brands or credible investors on board. Investors take notice of what you’re doing. It was much easier for us to raise when Just Eat invested in Hollabox – it’s a name everyone knows. We tried to raise 3-4 months into the start of our journey. It was too soon. Twelve months later, we had developed, learnt best practices and understood the investor landscape. Our pitches were better, we had a more mature product and a better understanding of our users. That, and a clear road map, meant we successfully raised. Hatty: As you prepared to raise investment, what were you excited about and what concerns did you have? Sue: I was excited about the prospect of being able to realise our business dream and bring our product to market so that we could make a difference in people’s lives. I was concerned at the length of time the financing took as we had to deal with two organisations (three if you include the grant we took) and individual angels. However, I understood the need for due diligence on both sides of each transaction. I needn’t have worried. We’re very happy with the group of seed investors we are working with now. Collectively and individually they are all very willing to help us with our business goals without becoming too involved in the business which is a good balance. Adam: I was excited about meeting successful entrepreneurs and people who had a vast knowledge of start-ups and business. People who could open doors and give advice. Getting their time was precious, even if it didn’t lead to investment. I found people are willing to help and offer advice, even if they don’t invest. I was understandably concerned about getting rejected by investors. We received many “nos”. It’s very common for startups on an investment journey but, naturally, the first few always hurt. There’s a book I’d recommend – “Rejection Proof” by Jia Jiang. It helped me develop my investment armour and mindset. Hatty: Did you have a “lead investor”? Did that make the process of raising investment any harder or easier? Sue: We did have a lead investor and it was very helpful in the seed round as this provided additional confidence to other investors. Adam: At first, no we didn’t. We secured a place on a couple of accelerators, including Just Eat. Through this we found a lead investor, the founder and CEO of Tossed. Securing a lead investor meant we had terms sheets in place, a committed valuation and share price and a high percentage of investment target committed. That certainly makes raising investment easier. Hatty: What practical advice or tips would you offer to anyone preparing their business for investment? Sue: Have a clear idea of how you’re going to make money and what the projected return on investment will be for the investor. 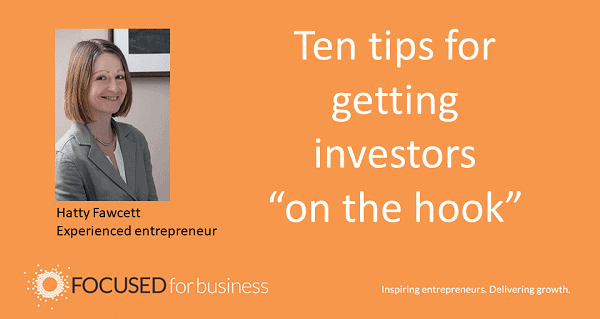 Investors are somewhat comforted to see your passion and vision but you also need to know where you want the business to be in 3 – 5 years’ time. Adam: I would say introductions are key. Investors get hundreds of investment opportunities a week. The way to make sure your start-up stands out is to be introduced by someone the investor trusts. To make sure this happens, build out your network. Become part of networks, accelerators, communities and attend meet-ups. Use your network to ask for introductions. Don’t just go straight in for “the ask” either. Warm up your contacts with regular progress updates, offer help where you can and show an interest in their own ventures or activity. Reaching out cold is harder and comes across selfish. Help your community, and, when the time is right, it will help and reward you. Hatty: Do you have any advice or tips on how to maintain your energy, motivation and commitment when raising investment? Adam: Believe in what you’re doing. You started your start-up because you saw an opportunity and you’re one of the few people that got up and decided to do something about it. Believe that others will see that opportunity too and want to help you. It is draining emotionally and time wise, and the sucker punch is that it doesn’t always have a happy ending. Sue: In my experience to raise investment requires a lot of energy and it can be exhausting physically. If you’re into exercise then obviously this will help with the stress. I’ve met some great people along the way who have encouraged me when I needed it the most for which I’m most thankful.